Me and cookie dough go waaaay back. My first cooking memories are of me standing on a kitchen chair so I could reach the counter to stir chocolate chips into cookie dough. I was maybe four. And like most kids, it would go: a chip for me, one for the bowl, lol. And then a fingerful of dough (because for some reason back in the 80s raw eggs didn’t seem to scare us as much?). Oh yes, I have very fond memories of cookie dough. 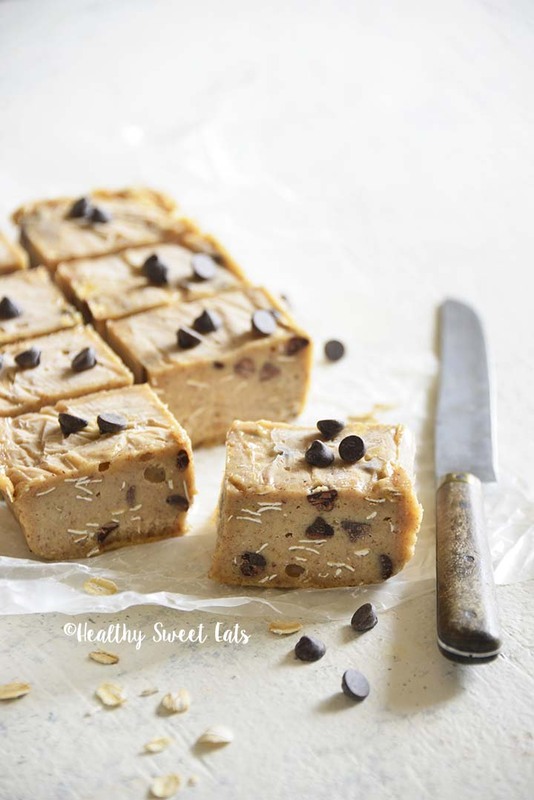 This Low Carb Chocolate Chip Cookie Dough Freezer Fudge is a protein-rich, low-carb way for me to satisfy my cookie dough cravings while staying on-point with my nutrition goals. You’ll be surprised at how much it really tastes like cookie dough! I store it in the freezer, but I like to let it sit at room temperature for 10 to 15 minutes before serving for real cookie dough consistency. Fudge is a type of candy traditionally made from sugar, butter, and milk that are heated to soft-ball stage, and then beaten while cooling. Chocolate is a very popular flavor, and mix-ins, such as nuts or candy, are also common. Cooking sugar to the soft-ball stage is the method for making old-fashioned fudge, but there are a lot of other fudge-making methods. Instead of cooking sugar to the soft-ball stage, some recipes call for using marshmallows or sweetened condensed milk (which is cooked down milk and sugar). Additionally, some recipes also call for corn syrup to sugar to help prevent sugar crystallization. The easiest way to make homemade fudge is to use sweetened condensed milk. Melt it with the right proportion of white, milk, or dark chocolate and you have fudge! And you can even melt it in the microwave (or use a double boiler). You can easily customize this easy fudge any way you like with different flavor extracts (vanilla, peppermint, coconut, etc.) and mix-ins (coconut, nuts, dried fruit, etc.). 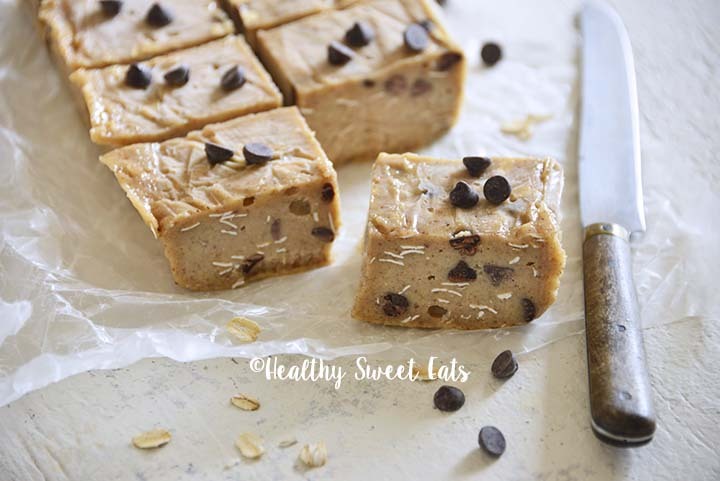 Healthy fudge is another story! Typically, sugar is what we want to avoid, so we have to come up with an alternative that will still yield a soft, creamy candy. Note that you don’t need to use all of these ingredients in a single recipe! In my Low Carb Chocolate Chip Cookie Dough Freezer Fudge I used a combination of nut butter, whey protein powder, almond flour, and coconut flour as the base. 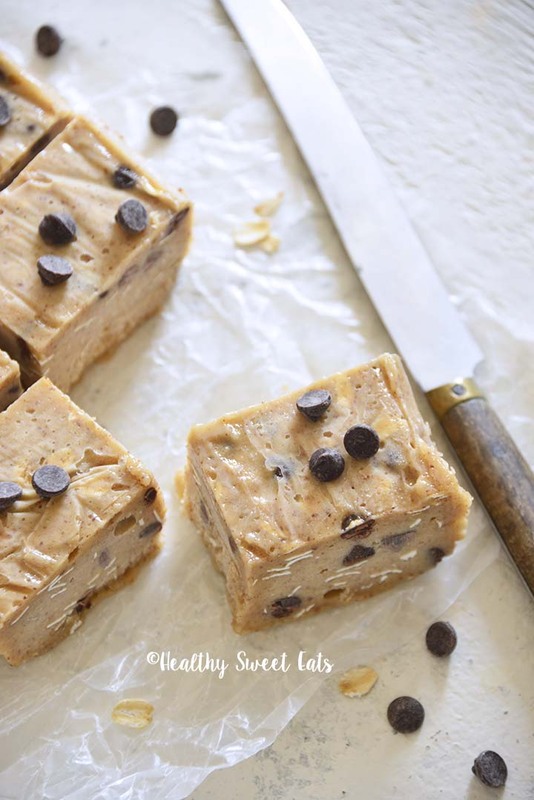 A lot of cookie dough fudge recipes use white chocolate as the base because it’s a natural choice when you don’t want a regular chocolate fudge. But a lot of people don’t like the flavor of white chocolate! For my Low Carb Chocolate Chip Cookie Dough Freezer Fudge I didn’t use white chocolate or cacao butter (which is used to make white chocolate), so there is no flavor of white chocolate. I used a combination of vanilla and almond extracts to get a cookie dough flavor. 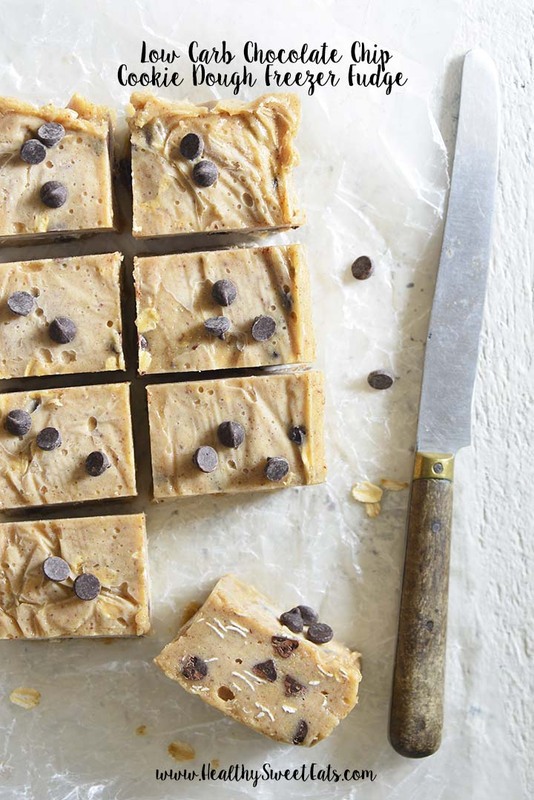 Another common ingredient in cookie dough fudge is all-purpose flour. The first issue with all-purpose flour in fudge is that the flour can have a raw, sort-of gummy flavor. The second potential problem with flour in fudge is that if you’re looking for a classic fudgy texture, flour isn’t necessarily the way to go. Not to mention, if you want a healthier fudge, all-purpose flour may not be the best option because it’s high in carbs (and it also contains gluten, which is an issue for a lot of people). 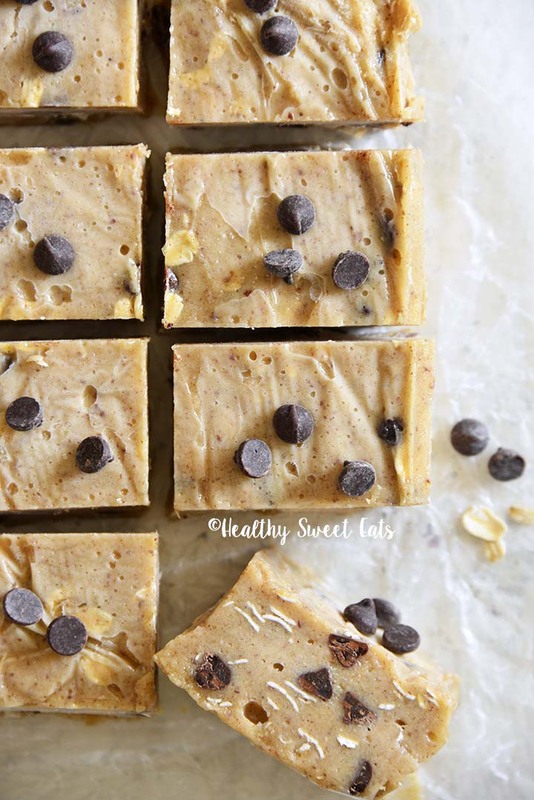 My Low Carb Chocolate Chip Cookie Dough Freezer Fudge doesn’t use all-purpose flour! Instead, I use nutrient-rich flour options that are free of gluten and lower in carbs: almond flour and coconut flour. Most no cook fudge recipes use a microwave or double boiler to melt together chocolate and sweetened condensed milk. 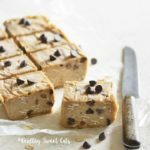 My recipe for Low Carb Chocolate Chip Cookie Dough Freezer Fudge doesn’t even require that step! To make this fudge, the only ingredient that needs to be heated is water. Freezer fudge is typically a healthier fudge than traditional fudge. It doesn’t usually have sugar, so it uses other ingredients, such as nut butter, for the base. This type of fudge needs to chill to fully set, and it’s commonly either chilled in the freezer until set and/or stored in the freezer. To make my Low Carb Chocolate Chip Cookie Dough Freezer Fudge, I first dissolve the sweetener in boiling water and then beat it with whey protein powder. After that, I add all other ingredients and mix until smooth. It couldn’t be easier to make! Use a handheld electric mixer to beat together the dissolved sweetener and whey protein powder until the mixture is thickened and foamy. Beat in the nut butter, stevia, vanilla, almond extract, and stevia glycerite until smooth. Add the almond flour, sift in the coconut flour and salt, and stir until mixed well. Stir in the oats and chocolate chips. Line a 9 by 5-inch loaf pan with parchment paper and pour the batter into the bottom. Smooth the batter out, lay a piece of plastic wrap directly on top, and refrigerate 4 hours or freeze 1 hour before serving. Cut into squares, wrap each in parchment paper, and store in a zip-top plastic bag in the freezer for up to 3 months. If You Omit the Oats: This will reduce the carbs to 4g per serving, but I really like the flavor and texture that the little bit of oats adds. Serving Tip: Let this fudge sit at room temperature for 10 to 15 minutes before serving. Disclosure: This post contains Amazon affiliate links to products we believe in, which means that even though it doesn’t cost you anything extra, Healthy Sweet Eats will receive a small amount of money from the sale of these items.